Sending emails with the purpose of enhancing the relationship of a merchant with its current or previous customers and to encourage customer loyalty and repeat business.Sending emails with the purpose of acquiring new customers or convincing current customers to purchase something immediately.Adding advertisements to emails sent by other companies to their customers. 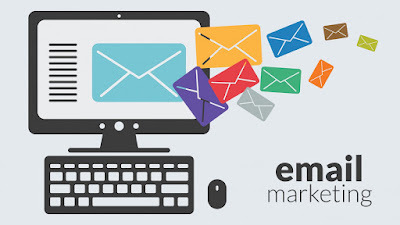 Email marketing has become an essential tool for business ever since the introduction of the Internet to the world. An exact return on investment can be tracked and has proven to be high when done properly. Email marketing is often reported as second only to search marketing as the most effective online marketing tactic.Advertisers can reach substantial numbers of email subscribers who have opted in to receive email communications on subjects of interest to them.Over half of all Internet users check or send email on a typical day.Email allows marketers to reach out to consumers with personalized, relevant, dynamic messages. The disadvantages of email marketing surround the rejection/spam rate of the emails by the consumers’ email program, negatively affecting the delivery rate of the emails. This has somewhat been eliminated with the idea of “Opt-in” emailing, where the consumer consents to receiving the emails and therefore eliminates the idea of receiving unsolicitated emails – Ideally maintaining emails that are relevant and appropriate to each individual recipient. ✔ Cost: Email marketing is CHEAP, there are no two ways about it. Whether you do it yourself, or through an email marketing agency, marketing to hundreds of consumers via email is going to cost you tiddlywinks compared to other channels of advertising. ✔ Success: Emails can be targeting specifically to the ideal consumer. With this concept in mind, along with email cost-effectiveness, it’s no wonder that email marketing’s ROI often blows other direct marketing strategies out of the water – The trick is that you have to get it right! ✔ Measurability and Flexibility: With the analytics available today it’s easy to track responses to your emails exactly, in order to work out what parts of your campaign are working and what parts aren’t. With this knowledge, you can then react instantly to modify your campaign strategy if need be. ✔ Creative: This refers to the overall design of the email (layout/images/color). Specifically, it is a good idea to ask each customer whether they would like the emails in text or HTML as there is often a great preference for one over the other. ✔ Relevance: Targeting, targeting, and more targeting. Make your emails relevant and personalized to each recipient if you want that response rate to rise. ✔ Incentive: Recipients look at emails and think “WIIFM?” i.e. “What’s in it for me? ?” There’s no such thing as a free lunch right? Well… Offer the recipient a “free lunch” for participating and they will be more likely to respond. ✔ Timing: Don’t send out an email that recipients will receive overnight, let it pop up in their inbox during their working day. This also expands to selecting certain days, months and even years. Remember – You can test and measure what timing works best for which email. ✔ Integration: Companies cannot just rely on one method of marketing, nor can they rely on several methods of differentiated marketing. Instead, best marketing practices utilize integrated marketing communication (IMC) where all aspects of their promotion work together to create a whole. Email marketing must be including here, therefore your emails must carry the same image and message as your entire operations. Even the timing of the campaign must work in with other aspects of your marketing mix. ✔ Copy: When considering the copywriting for your email you must consider all aspects of the language, from subject line through to your mail signature. With emails, not all links should be saved for the last sentence, pop them in early to grab that impulsive customer! ✔ Attributes: Here attributes including the subject line, from address, to address, date/time of receipt and format. Once again, testing your campaigns can rule out the attributes that customers consider spam and highlighting the attributes that will work best for your business. ✔ Landing Page: Want those emails to turn into sales conversions? Don’t just hyperlink your customers to your home page; show them exactly where you want them to go and make it quick and easy to complete any forms! So yes… Email marketing is a vital component in many industries, especially for creating those important customer-firm relationships. Learn to use it well and it will definitely bump up your company’s success.